A Tier 1 DMS like R+R/ADP (CDK) for a fraction of the price - and 3rd Generation! DealerStar's DMS includes items not found in many older systems like reporting, payroll, multi-company centralized accounting, dispatching, dashboards, calendars, time clock, parts cost averaging, labor grids, and technician terminals. With its web-based design, DealerStar is able to offer a Tier 1 DMS system like R+R or CDK (former ADP) with mobile access for a price that is lower than many of the Tier 2 or 3 systems. Fully certified for GM dealers, VW, and KIA, DealerStar is in the process of obtaining Chrysler, Honda, and Ford certification along with others. 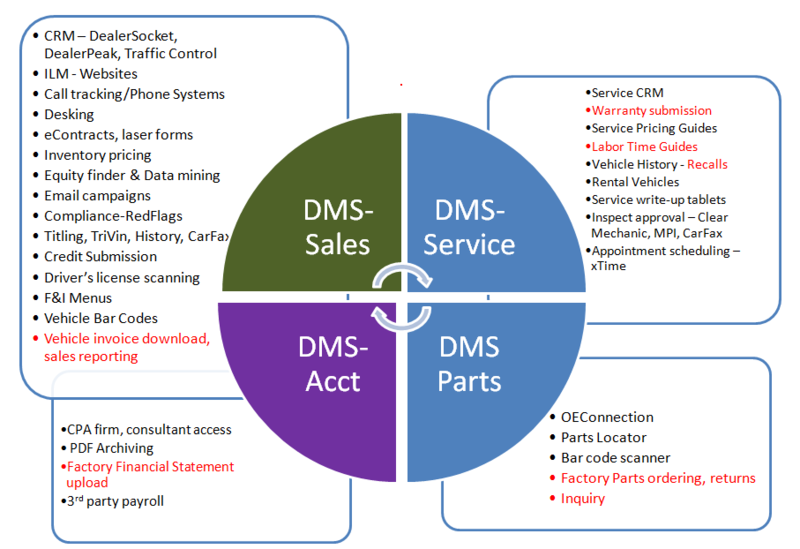 These 6 factory certifications cover over 80% of the dealership DMS market. For information on joining our charter investors or becoming an International Reseller, please visit our investor page or email Sandi. "DealerStar appeared to be very user friendly. Plus, with your background and knowledge of the industry, I'm sure it will be a huge success. The one thing that I think was especially favorable to the group was the cost."